If you are looking for the right structure to improve your garden or make your yard look more classic and sophisticated, then you certainly want to consider a quality pergola from Alan’s Factory Outlet. Like our sheds, carport structures, and other portable buildings, we offer a full selection of wood pergolas that have been selected with the needs of many different homeowners in mind. Moreover, as you have come to expect from our products, the wood pergola structures we carry in our extensive catalog are also available at competitive prices and with many excellent delivery options to most states. 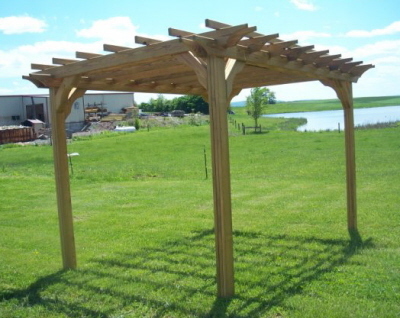 Unlike many other wooden pergola structures and kits available elsewhere, Alan's Factory Outlet Amish made pressure treated pine wood pergola kits are all precut with all hardware included. This makes putting them together easy even if you have never constructed a pergola before. Our Pergola Kits can be easily assembled within 3–5 hours with just 2 people. This makes our wood pergolas a great weekend project. It only takes a few hours to improve your garden with one of our wood pergola structures. Our pergola kits are handcrafted by the Amish, so you can be confident in the durability and quality of every wooden pergola structure that you buy and build. This also means that our wood pergolas can easily handle the weight of any vine or plant that you allow to grow on your pergola when you want to create the effect of a traditional garden. Many of our customers use our pergolas as trellises for ivy, but there are many other vines that look great on one of our wooden pergola or other pergola structures. Our pergolas come in many different sizes, so it is easy to find a wood pergola kit that will fit perfectly in your garden or yard. Several options are also available with each pergola such as a clear wood finish, and lattice on top of the Pergola. You can choose the pattern for your optional lattice on the top of the pergola to be standard lattice or the privacy lattice that blocks more sun from under the pergolas that you build with our kits. This makes our wooden pergola structures perfect for any need or landscaping design that you have incorporated into your garden. 8' 2" Overall Height, Actual Head Clearance 7' 2"
Free delivery on pergola kits to VA and WV. If you do not want a wooden pergola, vinyl pergola kits are available or maybe you need a gazebo to go with the pergola that you purchase, we here at Alan's Factory Outlet also have wood and vinyl gazebo kits that are shipped nationwide in the USA. Free delivery on all gazebo kits and pergola kits is available in Virginia and West Virginia. 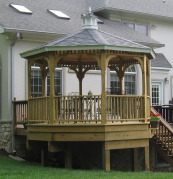 Pre-built gazebos are available with delivery to VA and WV.